Our warehouse manager Angie has family friends that had a fire earlier in the year. They were under the impression that they had to use the restoration contractor their insurance suggested and did not realize they had options and could decide to go with another company. After several weeks Angie was speaking with her friends and they mentioned to her a few issues that had transpired and mention this doll. This doll has special meaning. The homeowners had a daughter that passed away at a young age. After she passed away they came upon a company called ‘My Twinn Doll.’ You send in a picture of a child and they create a doll to look like them. This doll was made of their daughter, Kelsey, after she passed away. They show collector cars and one of them is green which was Kelsey’s favorite color and they kept this doll in that car. 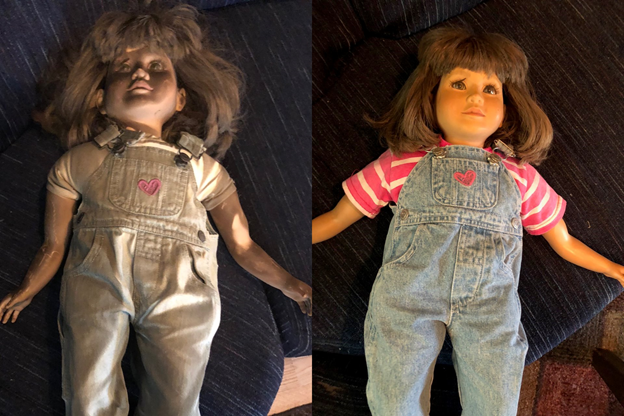 When the other restoration company went through their contents they said that they would not clean the doll even knowing that there was some sentimental attachment. When Angie saw the doll many weeks later, she knew the story behind the doll and asked about it. She took it home and cleaned it. She had explained that because of the fire and how long the doll sat with soot on it that there may be some pitting or staining but that she would do her best. At the time of the fire, they were in the process of cleaning the dolls’ clothes and the shirt was not on it and somehow had been disposed of in the restoration process. Angie had asked the homeowner about the shirt and she had mentioned that it was pink and white striped. Angie went on a search to find a shirt for the doll. The company that manufactured the doll had gone out of business in 2003. She searched online and was able to find the shirt by purchasing someone else’s ‘My Twinn Doll’ . Even though this was a job that a competitor completed, the homeowners told Angie they would keep Paul Davis in mind if anything came up in the future and they will definitely be referring Paul Davis. Angie never said anything bad about the other company and only explained what should and can happen. It is stories like this that touch our hearts and keep us doing what we do every day. Team members like Angie delivering Best in Class service and displaying our brand with pride are the foundation of Paul Davis and the building blocks to our future.